The onions were planted 5 inches apart. For more information on planting onions click this link to planting autumn onions. he scattered a handful of fertiliser onto the soil. He chose a 7.7.7 fertiliser, reasoning that he has a virgin plot, so it will need a bit of everything. 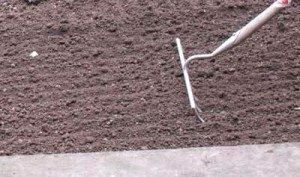 he broke the soil down to fine lumps using a rake. The Chef is planning to plant broad beans as soon as possible and is going to look for some Express Broad Bean seed. But it has been good to hear that he has already been planting onions into the plot.